The pre-visualisation suite in East Molesey has played host to many designers and programmers over the years, producing a wide range of events such as the London 2012 Olympic Ceremonies. PRG strive to provide a creative environment that is the ideal for clients to view their lighting, scenic automation, and video in a virtual 3D environment, in advance of selecting equipment or producing scenic elements. Clients can visualise all three disciplines in one of two suites in comfortable surroundings with friendly staff on hand. Services include creation of 3D models of the client’s lighting plot and set prior to arrival and a full range of consoles and lighting fixtures. The two suites available are 500ft.² and 365ft.² plus a demonstration / WYG suite with hanging facilities 2900ft.². 24 hour access is available and they are conveniently situated within the M25, 25mins from Waterloo by train. HD 6000 Lumen projection or optional 50" plasma display gives easy viewing by client. There is a Bose sound system and 1/8 inch input for iPod/music player. Lighting workstations are equipped with programmer’s console of choice. Video workstations have a PRG Mbox EXtreme media server. 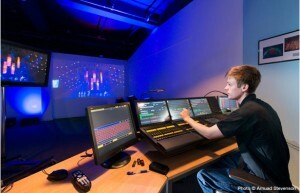 Lighting pre-visualisation software includes the latest versions of CAST wysiwyg Perform and ESP Vision. "I have used the WYSIWYG Suite at PRG East Molesey for productions of all sizes, from small tests and studio shows to large scale productions like the Super Bowl Half Time Show and the Eurovision Song Contest. In a pleasant and convenient location easily reachable from Central London, with strong logistical, practical and technical backup, it is an ideal place for pre-production, WYSIWYG at PRG is an extremely cost effective and productive option," says LD Al Gurdon.